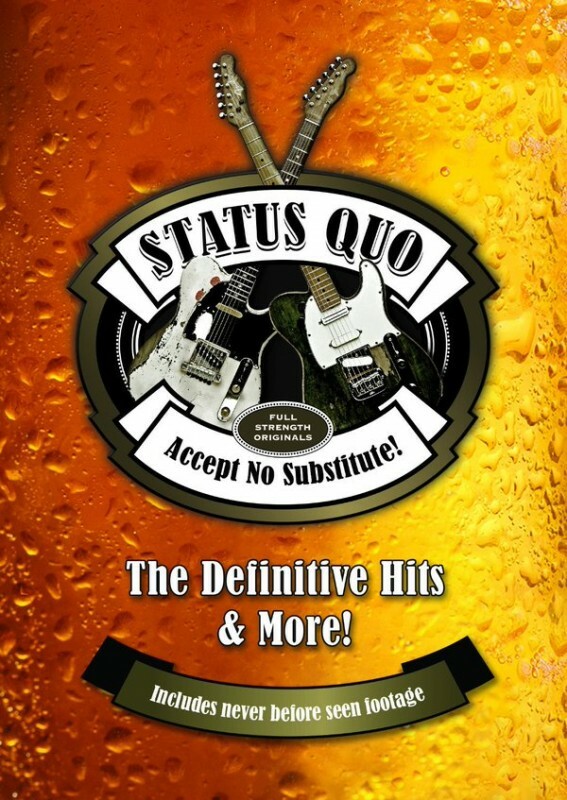 To tie in with the winter tour of the same name and celebrating the fact that Status Quo have had a career that has spanned an incredible six decades, 'Accept No Substitute!' is a Triple CD collection, whittling twenty-three albums down into fifty-four tracks. They've done a masterful job in selecting tracks from every era, but there is nothing new or unreleased on the audio portion, so I've elected to go for the companion double DVD set of the same name. Many of the videos like 'Whatever You Want' just show the band doing what they do best, which is Rock out, but it's nice to see videos for the more uncharacteristic but excellent 'Living On An Island' and the track that sticks in many a Quo fans craw, 'Marguerita Time'. As the videos move into the eighties, Alan Lancaster and John Coghlan depart, leaving Francis Rossi and Rick Parfitt as the main focal points. The band, by their own admission, lost their way a bit here and while they still enjoyed success with good songs like 'In The Army Now', the real low point for me was the dire 'Ain't Complaining' album, with an equally dire video featuring Griff Rhys Jones, who attempts to offer some comedy relief in the form of what is basically gurning, and failing abysmally. Things start picking up again with the fun 'Anniversary Waltz' Rock and Roll covers medley, and the material from 'Rock 'Til You Drop' sees the band start to rediscover their roots. It's great to see 'Sherri Don't Fail Me Now' from one of the most underrated Quo efforts in my opinion, 'Thirsty Work', and the first disk rounds things off with the collaboration with The Beach Boys on 'Fun Fun Fun', a pairing with Maddie Prior for 'All Around My Hat' and a decent stab at Fleetwood Mac's 'Don't Stop' from the big selling covers album of the same name. Disk two features a couple more covers from the 'Famous In The Last Century' record, before cracking footage of 'All Stand Up' and the catchy 'Jam Side Down', both taken from the magnificent 'Heavy Traffic' album, sees the guys entertaining the troops on a warship. These videos are considerably bigger budget and more visually entertaining, as 'The Party Ain't Over Yet' sees the guys strapped to bi-planes and "playing" hundreds of feet in the air, before being surrounded by some stunning cheerleaders. The powerful 'Beginning Of The End' has them performing on the London Eye and the awesome 'Two Way Traffic' from 'Quid Pro Quo' demonstrates the band are still more than capable of really Rocking. Rounding off with three tracks from the 'Bula Quo!' film and soundtrack album, disk two also offers some enticing extras. There is a vintage Beat Club performance from 1970 which may interest some fans, but that I personally found was simply a demonstration of how much the band had improved. Then there is a selection of live material, with eight tracks recorded at Wembley Arena in 1996 on the 'Don't Stop' tour. Only one track from that album is included (which is a shame as they played several) and that is 'All Around My Hat' with Prior joining them on stage. The rest of the show sees the band blast through classics from the past. They are in great form, but unfortunately the mix is pretty weak and really needs some work, with the vocals sitting way higher than the rest of the instruments. Also included are tracks from the band's excellent performance at Download 2014, with seven songs represented. The quality here is much better and the band deliver like the seasoned veterans they are. Considering the sheer amount packed on here, there's very little which had me reaching for the skip button. In fact, I had to watch it over the space of three evenings to witness it all! As a big fan of Quo, while I am very impressed with the track selection on the triple audio set, the DVD set is definitely the one that offers the most value. A whole host of these videos I had never seen, and with the addition of the live material too, it's well worth purchasing; a phenomenal collection!